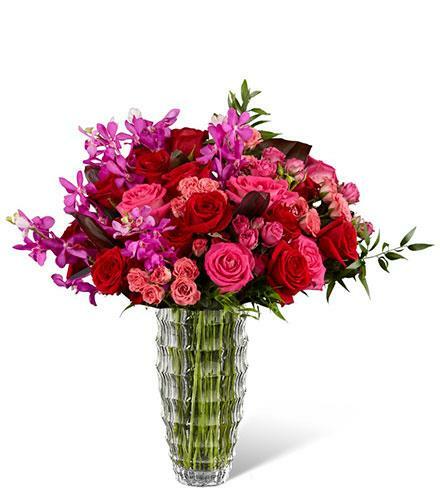 Deeply devoted to claiming your special recipient's heart with a bold mix of color saturated in it's finest form, this bouquet speaks to everlasting romance with each and every stem. Rich red roses mingle with the eye-catching hot pinks of orchids, roses, and spray roses that help to convey your heart's every wish. Finished with lush green accents to delight the eye and make each bloom pop in it's intended way, this luxury bouquet arrives in a clear glass vase lined with exotic ti leaves to add even further interest to this already opulent design style. A gift of love that will surely touch their heart. Luxury Flowers - Heart's Wishes Luxury Bouquet.